Well- I survived Valentines' weekend! It was busy!!! Typically I have a lot of valentine cookie orders- however- this year was wedding cakes instead! God knew how much I could handle and gave me the cake business rather than a lot of cookies this weekend! 5 totally different cake flavors, fillings and toppings- so my kitchen was covered and fridges were filled! They looked really neat when done- and even better once delivered! 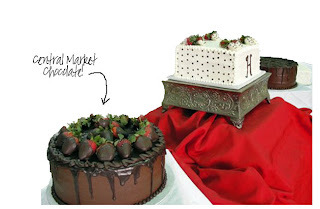 I used the Central Market chocolate to drizzle on the groom's yellow cake with chocolate frosting. And used the white chocolate to dip strawberries on the bride's cake. Yum Yum!! On Saturday afternoon my daughter was finally able to fill her Valentine treat bags to give to her classmates in Sunday School - she had been waiting all week to get that done! They were ready to go and just needed me to put on the toppers - luckily we didn't finish them before we headed back to town for the wedding reception (the couple had gotten married in December - on our Anniversary!) so this was the celebration for local family and friends. At the end of the evening the mother of the groom gave my daughter a huge bag full of unused Hershey kisses - so when we got home she was able to fill the bags up a bit more with chocolate!!!! Oh how I love chocolate- there was some leftover from the cakes....so we used it to make a chocolate pie for Cattleman hubby's birthday! Another Yum Yum!! Well- we had a few responses about the birds- So.......even though most birds fly south in the winter- (Especially this year- we've had the coldest winter in at least 20 years- and soon to be the wettest if we get more rain in the coming week and a half!) Oh- back to the birds----- One is going to fly north to Michigan!!! Yes- a reader from up there will receive a delightful little bird to fly around to any project in her house where it may be of assistance. Another bird will fly closer to home- to Gonzales, Texas- The cradle of Texas Independence! I hope both of these readers will enjoy their birds- I know we do!!! Card created for Great Grandma by my daughter- it's a sun catcher tissue paper heart that she wrote; you bring my heart joy! Made my heart jump with joy to see hers so full of love and sweet! 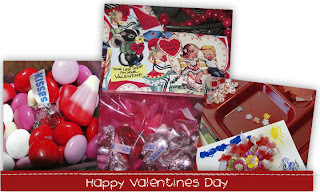 Enjoy your leftover Valentine Chocolates if there are any.